Saddled with paperwork for your summer horseback riding camp? 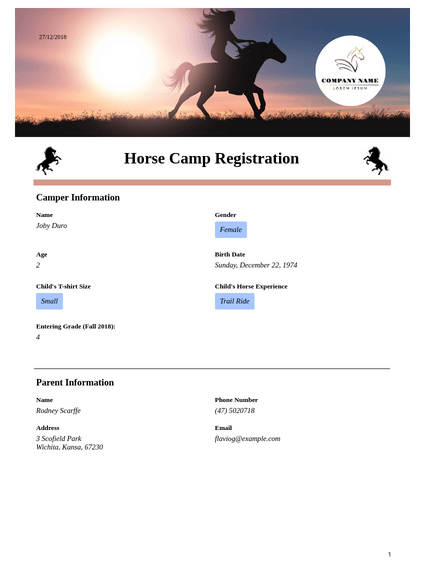 JotForm’s Horse Camp Registration PDF Template makes it easy to register riders of all experience levels for your equestrian camp. All incoming registrations will automatically be saved as personalized PDFs that can be printed out for the first riding session or shared online with instructors and counselors. This template will collect camper information, contact numbers, and parent signatures. Take the reins and customize the sample however you’d like with JotForm’s PDF Editor. Change the fonts and colors, write additional form fields, and include the logo for your ranch or stables. With rider information saved as easily accessible PDFs, you won’t have to jump over hurdles to successfully manage registrations for your summer horse camp. Will you be using after child care? Do you give permission for anyone else to pick-up your child? Pellentesque eget nunc. Donec quis orci eget orci vehicula condimentum. Camp. In case of injury, I wish to be contacted as soon as possible at the telephone number listed previously. emergency contact cannot be contacted. In the event of serious illness or injury, and so that my child may be sent to the local hospital via ambulance, I understand that I am responsible for all charges either through health insurance or otherwise.